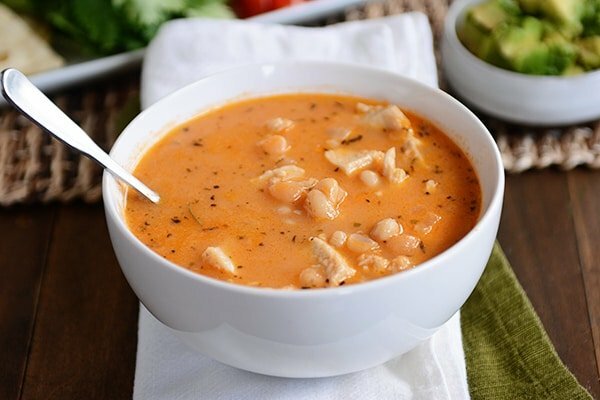 First posted nearly six years ago, this white bean chicken chili so delicious (as in, it’s one of my favorite soups), I decided not only did it need updated pictures and a few added notes but it deserved a moment in the spotlight again. Poor little thing. Tragically buried and forgotten in the dusty, dark archives that is eight years of blogging. The recipe, originally from my Aunt Marilyn, is a snap to throw together (we are talking less than 30 minutes, start to finish). I absolutely love this soup. And it has been known to win a chili cook-off or two, just in case you are wondering. While it is unadorned in the pictures, we usually load our servings (yes, plural, because seconds are not optional) with all sorts of goodness: crushed tortilla chips, avocados, tomatoes, olives, cheese, sour cream. It’s delicious plain Jane or loaded to the max. I’m so happy to reintroduce this soup to the world. If you’ve made it before, check out the notes in the recipe as I’ve made a few little changes over the years to make it creamier, easier and if possible, even more tasty. And if you haven’t made it, well, you should. Don’t forget to check out all the comments below from others who have made it and reported back (so helpful!). In a medium saucepan, heat the olive oil over medium heat. Add the onions and cook, stirring often, until they are translucent, about 5 minutes. Add the remainder of the ingredients, except the cheese. Heat over medium heat, stirring occasionally, until the soup comes to a simmer. Reduce the heat so the soup is simmering but not vigorously boiling and add the cheese one small handful at a time, stirring to let each addition melt before adding the next. Give the soup a good stir making sure all the cheese has melted. Season with salt and pepper to taste, if needed. Serve with additional toppings (optional): crushed tortilla chips, olives, sour cream, avocados, cilantro, tomatoes. UPDATE: A single recipe of this soup doesn't make a whole lot - I always double it for our family of seven (five kids, two adults). Of course, it goes a bit further if adding on toppings so keep that in mind. Originally the recipe was posted with mozzarella cheese. It's very yummy that way and occasionally I still use it but for the most part, I've changed to using Monterey Jack for a much creamier and smoother texture. Incidentally cheddar doesn't seem to work well here - it is a bit to greasy and doesn't melt well. Also, the salsa in this recipe is quite important - use a salsa that has great flavor as it is a key component to the soup. A salsa with a lot of heat is obviously going to make the soup spicy. I like to use a mild or medium salsa (Trader Joe's chunky sals or fire-roasted salsa are two of my favorites). And if you want to change it up a bit, using a green salsa is a wonderful variation. You can probably tell this soup is endlessly adaptable. Don't forget that leftover, cooked turkey is delicious in this soup. Another note - I often sub celery seed (just 1/4 teaspoon) for the celery salt and then just add additional salt to taste if needed. Made this yesterday and it is excellent. I used canned navy beans and added a little crushed red pepper. It was even better heated up for lunch today. Very tasty and easy to make up. Scrumptious. I had never used celery salt before but bought a bit at the bulk store. Do you normally use ground oregano or oregano leaves? I’m going to put the leftover smoked turkey to good use. Thank you for this recipe. It sounds yummy! I usually use dried oregano leaves. Wow! This soup is amazing! I’ve made it a lot, and never get tired of it! So yummy!!!! Yummy! I followed the recipe exactly, only omitting celery salt, because it’s not something I keep in my pantry. Everyone in my family of four enjoyed it and we had enough for dinner for two adults and two kids, with one bowl leftover for momma for lunch. Definitely a winner for a small batch/weeknight chili. This soup is so tasty! We don’t eat dairy so I skipped the cheese. I added some coconut cream (canned), nutrional yeast, additional salt ( pink Himalayan), and pepper. I also used a rotisserie chicken and grabbed pre-chopped onion and celery (in lieu of celery salt) at the store to make this even quicker after work. So tasty! I was so excited to make this! But we had a little problem with our Monterey Jack cheese getting clumpy instead of mixing in, despite following directions! Help! I’m hoping I can do something to salvage the soup (I made it with homemade pinto beans which tasted great). Would I have better luck with home-grated cheese instead of store bought pre-grated cheese? Yes…unfortunately pregrated cheese is coated with a powdery substance that prevents it from clumping in the bag, but it also makes it so it doesn’t melt well. I’d just reheat on low and see if that will salvage your soup (even if it’s clumpy, it will still probably taste great!). I didn’t know they sold pregrated Monterey Jack cheese so I’m sorry I didn’t clarify in the ingredients. I love this recipe. Very subtle flavors. It’s delicious. I poach the chicken so it’s very tender. Family favorite (including two preschoolers), and saved as a top Fall/Winter Fave. Love the simplicity of the ingredients (I just use diced celery and cook with onions, and add salt later with the rest of the ingredients), and how quickly this can be thrown together. 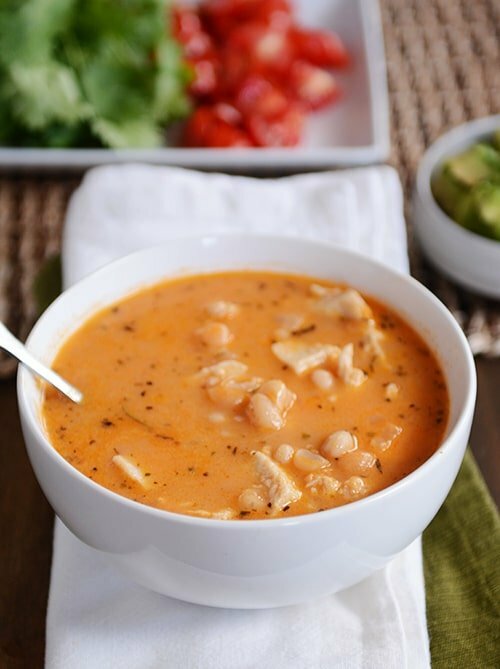 Even with the all that simplicity, this soup has some AMAZING flavor! You will want to double! Bonus points for also allowing my kids to chow down on something healthy. *Note – to quickly make my chicken, I roughly chop into larger chunks, boil in some water until cooked through, then throw in my standing mixer with beater attachment to quickly shred. Quick, easy, and love the texture. This has been sitting in my binder for a while and I finally made it. Why did I wait so long?!?!? I used taco sauce instead of salsa (family doesn’t like too many chunky things in soup) and added a bit of cumin. My husband, who is honestly picky and challenging to cook for, really likes it. So thank you again for helping me cook for my family! Loved this recipe! Made it for dinner tonight, it came together quickly and was devoured by my family! Thank You! This was so good. I finally made it last night after wanting to for so long. I doubled it and used a fresh refrigerated salsa (mild) from Whole Foods, which we love so much with chips, but is a bit watery and chunky with onions/peppers. The flavor was great, but I think next time I may pulse the salsa a just a bit in the food processor to cut down on the big chunks for the kids. Even though they eat plenty of chunks with the chips, I think a somewhat smoother texture in the chili would be preferred. Because it was not an overly thick salsa, I added a couple of squirts of tomato paste. We all ate it up with homemade rolls–perfection! Your blog is my go to for any recipe. This soup was fantastic! I made your slow cooker pork with tomatillos a few days ago and used leftovers as the meat for this. I used salsa verde as the salsa and colby jack for the cheese. Incredible! Thank you for all of your hard work and recipes! Just made a double batch of this… it’s so yummy! I made this recipe yesterday. My husband and I loved, loved, LOVED it. I made it exactly as specified in your recipe. It was good before I added the cheese, outstanding once I stirred that ingredient in. Adding salsa rather than canned tomatoes brought so much flavor to this chili. I do like a thicker chili, so I may add a few additional veggies next time, like bell peppers and maybe a small can of Mexicorn, just to suit my taste. Thank you for sharing this recipe with your fans! This was sooooo delicious!! Made using the divine one minute salsa and the flavors were amazing!! 2 y/o asked for seconds and 13 y/o asked to take leftovers for lunch! I just made this for dinner-very yummy! I used up a jar of salsa I had on hand and used salsa verde for the rest of the salsa called for. This is similar to my slow cooker version but this is quicker and tastier due to the jack cheese. Thanks for a new favorite! Oh Mel!!! I am so disappointed! I have come here for this recipe through out the years and when I looked tonight to make this soup again and this recipe came up I didn’t know what to do with myself! This looks delicious, but the cumin is gone, the basil, the half and half….this is a completely knew recipe! I wish you could of kept the original and named this one a different name so both recipes could be here! Is there anyway we can get the original recipe? and this time I will print it off so I won’t be scared to lose it again! Hey Catherine – I think you may be thinking of another recipe. This recipe never had those ingredients in it. Do you think you may be thinking of another recipe? But it has chicken in it, so when I searched, I wrote, “White chicken chili” and this recipe came up. But I printed it to put in my pantry to never have this scare again. I love this soup so much, NOW I can breath. HEHE. I just made this. What a great recipe…so easy, quick and delicious! It has a wonderful flavor! Thanks!! Nowadays I used to make it for my small family with chilly. Made this and the whole family enjoyed. The flavors are so much deeper and tastier than I even expected! Excellent soup! I made it over the weekend and both kids and adults loved it. It’s a “make again” for sure! I didn’t have celery salt, so I added a bit of garlic salt ( not the same, I know!). I think a little squeeze of lime juice at the end is key. We served with avocado, lime, sour cream, cilantro, olives and tortilla chips. this is super delicious! I used divine one minute salsa & shredded the mozz myself. I added chopped romaine along w other toppings, too. really yummy dish. so true…awesome w toppings but equally awesome w out! I made this chili last night. It was great!! I used Paul Newman’s brand medium salsa and left out the celery salt which I didn’t have. It was salty enough from the salsa and cheese. Thank you for this wonderful recipe!! I loved this and 3 of our 4 kids actually ate it. A miracle at our house when we are trying a new food. This will definitely be added to our rotation. Thanks so much. Threw this together after a very busy day; it was quick to make and delicious! Thanks! This soup is SO good, and seriously so easy to make!! Thank you, Mel! Mel, I am so glad that you reposted this recipe……that I had forgotten about. I prepared the chili today for the first time for my husband and me, and it truly delivered. It was crazy good and so easy to put together. Our tummies are so happy! Thank you for generously sharing your wonderful recipes with world. I just found this Recipe site and all sound delicious. 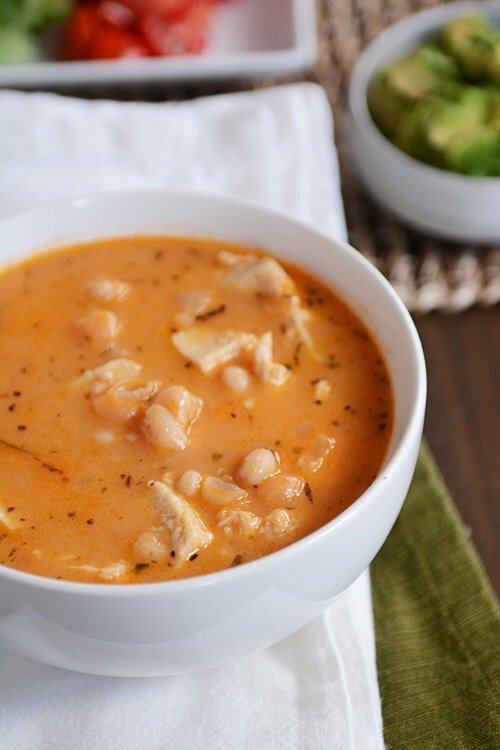 I plan to make some of this White Bean Chicken Chili soon! My son will love it, he has been telling me to make some for a while and I wasn’t sure about it and had not found the right recipe. So here goes, this week I have to try this! Thanks for the great sounding recipe and for all the comments. Also I would love to find a good Apple Turnover Recipe or Apple Fritters with plenty of Apples in them. I buy them at the Apple Orchard Sweet Shop and can’t find hardly any pieces of Apples in them, (since Apples are their Business and plentiful, I don’t understand it, so I will try making my own.) Hopefully my easy Best Ever Cinnamon Roll Recipe will work and add plenty of Apples. Gingerbread Old Fashioned is also a Recipe I would like, tried some but not like my Mothers from an old, old cookbook that someone else took from her kitchen. It called for a pinch of this and that…so fun to read the recipes. Some were delicious, and it was probably from the 30’s or 40’s…My Mom and Dad were married in 1934 and she always used her cookbook to be accurate with picture perfect Pies, Cakes and Desserts and that wonderful Gingerbread. My family were farmers and we all were taught to help grow the foods, prepare them to eat and help preserve them for the Winter months. We always had 3 meals a day, balanced and with Pies or Cake for Dessert. My Daddy was a lucky man to have a woman like our Mother and he was always working on the farm to prepare for the next phase of the farm work. They are Gone but Never Forgotten. I have made these several times and they are always a hit! I made this for a crowd for conference weekend. Everybody loved it! I put it together early Sunday morning and let it simmer gently all day–super easy. I used pace medium picante sauce and a combination of monterey jack and mozzerella cheese. Next time I’ll try some other brand of sauce just for fun. Thanks! One of our very favorites! This is so good and a lot lighter than the one I had that called for sour and heavy cream. Hi Mel, I wanted to serve this soup to some company and was wondering if you’d recommend some sort of bread to go along with it. Does this even need bread? Bread is great with this! Although you may not need it if you serve it with the toppings. Cornbread or a dinner roll would be yummy, though. You know another recipe that deserves another moment in the spotlight? The cheesey broccoli rice casserole. That is SUCH a flavorful dish, and I have totally stopped using Cream of Yuk soups. In my early bride days, I did use the velveeta and cr. of chix soup version, and we survived, but I made this again last nite and it is gone. I put cubes of ham in it, and substituted evaporated milk for the half and half, to cut calories. Oh, this looks delicious. I plan to take it to a potluck this weekend. Love your recipes, and recommend your site all the time. Thanks! The texture is a little different after freezing so I think it’s best fresh but it freezes decently. Thank you for sharing your recipes. How would you do a slow cooker version of this soup? Not sure as I haven’t tried it, maybe simmer everything except the cheese and add it at the end until it melts? I can attest to how delicious this is. I have made it several times and most recently this summer when the family was away for a boys’ trip, while I was having my own staycation. It was great with all the ingredients that I already had on hand. I am such a fan of your creamy white chili that I really don’t know if I will ever love another white chili. I fix it almost every week in the cooler months. I will give this recipe a try because I trust your opinion, plus your recipes have never let me down! Oh, this is one of our favs from your blog! (Love all of your Aunt Marilyn’s recipes!) We make it at *least* once a month, and there have been times it’s always in the fridge. SO easy and delish. Question: How do you keep your cheese from globbing up? I usually add a lot less cheese because it all melts together and I end up with globs of it. Any tips? I’m not sure what exactly the temperature should be when adding the cheese (boiling? simmering?). Thanks! Hi Kate, glad you love this one. I added some new notes to the recipe but over the years I’ve started using Monterey Jack cheese instead of mozzarella for a creamier texture. In general always keep the temperature below boiling when adding cheese. Just under a simmer is best in my experience. I frequently turn off the heat and let the cheese melt with the residual heat. It also helps if the cheese is grated or in very small chunks. The finer it is grated the easier it will melt. It can also help to add the cheese in stages, so that the first melts and blends before you add more. Thanks Mel & Alice! I will try turning down/off the heat and see how that works. I usually used bagged shredded cheese – maybe I will try grating some off the block next time, too. Thanks! Ah, yes, I should have asked you that Kate…preshredded cheese is coated with a powdery substance that makes it not melt as well as freshly grated so that can definitely cause clumping or texture issues. White Bean Chili and corn muffins – our favorite cold weather meal! Thanks for re-posting. I want to say that using Mexican Oregano makes a difference (in all south-of-the-border recipes) and is preferred. We love our WBC “Southwest Style” so we add a can of green chilis too. For deeper flavor I saute the chicken in Mexican chili powder first. We actually use chicken-style seitan to make it a scrumptious high-protein vegetarian meal, and add that in the last 10 min. of cooking. And this recipe freezes well! I was just dreaming of this chili while making breakfast this morning. First day we have that isn’t in the 80s, I’m making it! Yes, I think it reheats very well. Made this with leftover Thanksgiving turkey – yum…I doubled the recipe and the four cans of beans were too much for my family. I made a couple of mods – added more turkey stock and added some cumin and cayenne to warm it – it was quite yummy! Just made this using our leftover Turkey from Easter dinner. It was delicious. The cheese really made it incredible. Thanks. I made this last weekend and it was fantastic! I was looking for something that would come together faster than my regular white chili recipe, and this did not disappoint! Loved the addition of the mozzarella cheese, too. I used baby butter beans and it was so so good!! Thanks, Mel, for all your wonderful recipes! Tell Aunt Marilyn that this soup rocks! I wish I had made a double batch! Just yum. 73rd time I have made this. Just yum! I made this the other day and good thing it is so versatile because my brain was totally out to lunch. Long story short I used a can of pinto beans, a can of kidney beans, added celery since I didn’t have celery salt, jack cheese since I didn’t have mozzarella, and cumin since it started turning into a Mexican dish 🙂 I plan to make it again and follow the recipe, but it turned out great, Holden was ready to eat it again the next night. Recipes like this are great for me because while they may be kind of basic for more experienced cooks, they give a great outline for other similar soups, and help me be a better cook myself. Loved how quick it was, thanks! I made this last night and it was hit! It tasted so good and the best part was it was so easy to fix. I substituted the mozzarella cheese for Monterey jack because that’s what I had and it did fine. Great recipes and I can’t wait to try more! Was SO GOOD- family raved- even picky kids. Only had mild salsa- so added a jalapeno as recomended above- was fab and not too hot. Mel- you are rocking our dinner table lately- high 5’s all around. Made with best corn bread/honey butter which was gorgeous. Hi Erin – either that or use a low-sodium chicken broth…that could be the culprit of saltiness. I made this tonight for my family and my one year old daughter loved it! It was a little salty, and I did not add any extra salt to it. Should I cut down the celery salt next time? I made this tonight because I knew it would come together quickly. It tasted great! I subbed with ingredients I had on hand: Monterrey Jack for the mozzarella and cannellini beans and small white beans for the Great Northerns. The bean substitutions worked out perfectly, as the small beans broke apart and made the chili thick, while the cannellinis kept their shape and texture. Served with corn muffins, it was a nice comfort meal for a rainy night. Thanks for sharing! I made this tonight and while my family seemed to really enjoy it, I had issues with the cheese. Maybe I used the wrong kind of mozz. (not a high enough fat content) but the cheese was super gummy and the chicken stuck together and was chewy w/ all of the cheese on it. I added the cheese slowly, a tbsp at a time but it didn’t cooperate w/ me at all. I loved the flavors of everything and would love to make it again. Do you have any suggestions to help me fix the cheese issues I had? Hi Mandi – I’m not sure why you had issues with the cheese – that’s a bummer! The cheese definitely coats the chicken in a creamy layer but when I make it, the chicken doesn’t get really chewy because of it – at least that I can recall, since it has been a month or so since I made this last. Perhaps try cutting the cheese amount in half and see how that goes. Usually when I make it, I throw it all in and stir it around until it is all combined. Sorry I can’t be of more help! Loved the chili! So Easy and fast. Thank you for the great recipe. It was hard to dump in those beans undrained…I just like draining and rinsing them first. Have you ever made this and drained the beans? Does it make that much of a difference? 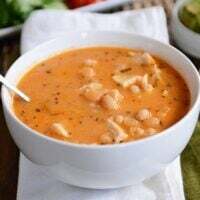 Dana – it’s funny you posted this comment because I just made this recipe last week and since I mostly have it memorized, I rinsed and drained the beans, forgetting that this recipe omits that step. You know what? It tasted great and obviously wasn’t a huge difference because I just barely remembered I made that change after seeing your comment. My point is that you could easily rinse and drain the beans and have a great result. The point in not draining them is to thicken the broth a bit but I think from now on, I’ll probably rinse and drain them, too. I’m off to edit the recipe. Stephanie – oh, what a great idea to use ham! I haven’t ever tried that and love the suggestion. Thank you! I made this chili again except I used leftover ham from Easter instead of Turkey from Thanksgiving – still a divine soup! You just have to cut down on the celery salt (to 1/4 tsp) since the ham contributes gobs of sodium. This recipe is a great base for any variation you want to try. Thanks! Hi Pat – glad you liked this! Great chili, it had a rich flavor and a nice texture! Hope to try the chicken bread braid soon! Melanie C. – this is one of our favorite soups, too…and I love your additions. Yum! just wanted to tell you how much I LOVE this chili! it really is yummy, and comes together so fast. I made it after Thanksgiving using leftover turkey, and I made it last night using chicken breast. one thing I do is I add a can of Ro-tel to it, just for a little spice, and I serve the bowls topped with diced tomato and avocado. SO delicious! thanks for all the great recipes!! Catherine – so glad you and your husband liked this! Thanks so much for letting me know. I made this and my husband raved! I have a few other white chili recipes, but he liked this better than the others, and it’s SO much simpler! Definitely a keeper! Jessie – thanks for letting me know you liked this! I’m glad it was fantastic for you. Shantai – oh, I bet this was delicious with homemade salsa and celery. Way to go on all the homemade (salsa, bread!). Awesome. I just tried this on Monday night and it was fantastic!!! Thank you for sharing!!! just made it and yummy!! added diced celery and used my homemade salsa from this summer… hubby loved it:) Ate it with some homemade Lion House bread… bring on the snow!! Stephanie – I agree, this soup is really, really simple. I bet it was divine with smoked turkey – yum! Candace – thanks for your comment! I’m glad that the recipes you’ve tried have worked out for you. Thanks so much for letting me know. Melanie C. – way to make this a gourmet meal (your margarita salad dressing sounds awesome). I’m so glad you liked the soup! I making this for dinner. Thank you! I am turkey sandwiched out. Cheers! This was delicious and almost too simple! Our turkey was smoked which added some great flavor to this chili. Thanks for the recipe! Thanks so much for all the yummy Thanksgiving recipes. I made your stuffing (no stovetop this year) and everyone loved it! I used artisan Labrea bread. It was so good! I also made pumpkin roll… and pumpkin bars! I would be lost without all your recipes! I am spreading the word of how great you are!!! I never seem to have turkey leftover…everyone picks and picks at them throughout the day! This sounds like such a fabulous way to use up that extra bit of turkey. I agree with you that I love turkey sandwiched between homemade rolls. Amazingly this year that’s about as far as the turkey stretched so I’ll have to use chicken for this recipe. I bet your Aunt Marilyn is so flattered by all of her recipes that are on your site and all the praise :-)! Looks delicious. If I hadn’t used up all my leftover turkey in my empanadas, I’d have tried it. Next time. oh yummy! this looks like a wonderful way to use up all that turkey! i hope you had a great thanksgiving! beans, meat, and spice make for a wonderful bowl of chili no matter what you use. great idea for leftovers! I made this for dinner last night and it was delicious!!! the only thing I did differently was I threw in a 4 oz. can of diced green chilies when the onion was cooking, just because I had it in the pantry! thanks for all your great recipes! I made Zephyr pancakes for dinner last week! Shauntel – I always tell my Aunt Marilyn how much commenters and readers compliment her so I’ll definitely pass along your praise. I’d be lost without her recipes, that’s for sure! Thanks for the tip on the chicken and I’m so glad you liked this; thanks for letting me know! Heather and Devine Irvine – it’s funny you asked about the cannellini beans because that’s what this recipe originally called for but I only ever have great northern beans so that is what I use – so in answer to your question, yes, the cannellini beans would work great! Also on the mild salsa question, you may think the mild salsa gives it enough flavor but if you like things a bit spicier than by all means use the mild salsa and add a jalapeno. That sounds delicious, actually! Does Aunt Marilyn know how much we all love her? P.S. For any others who hate touching chicken as much as I do, one large can of chicken (we prefer Tyson’s white, although you can buy the Costco or Sam’s Club brands in bulk, which are also good) works great in this recipe! Help! I just made your wheat/oatmeal cookies and it was a d i s a s t e r …and i’m made quite a few recipes of years and am a cookie woman…they are flater than flat than flat can be. like unedible. any ideas? my kids were helping me and i was holding a baby but i’ve re-read the recipe over and over again …i’m bummed. Also, I forgot one other question. I have a lot of MILD salsa on hand, but I have a couple of recipes that I want to make that call for MEDIUM salsa. Is it okay to just use the mild salsa and then throw in 1 or 1/2 of a jalapeno to give it the extra kick you’d get with medium salsa? Thanks! Hello! First of all, thank you so much for posting all these delicious recipes. I come here weekly for my meal planning! You are fabulous. Second, I am going to make this chili this week, but I already have two 14.5 ounce cans of cannellini beans on hand, not great northern. Does it really make a big difference, or am I okay to make it with what I have? I’ve made the original version of this soup for years and years and have used both types of beans with no problem! I can’t tell a difference, personally!